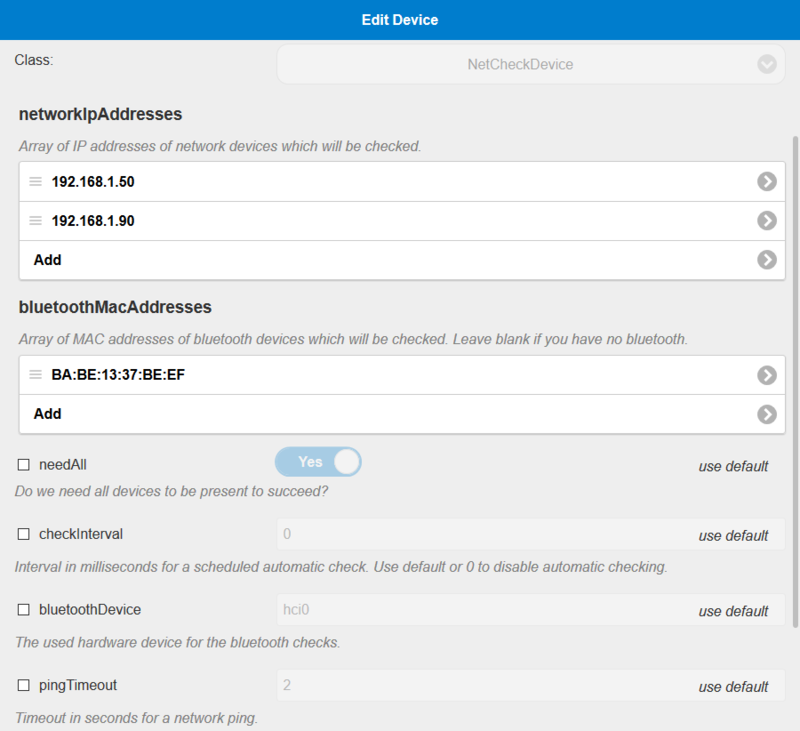 pimatic-netcheck is a pimatic plugin that allows you to check if some network or bluetooth devices are present. The main goal of this plugin is to send specific messages (using other plugins like pimatic-telegram) or do some actions if a contact sensor is opened and nobody is at home (no smartphones are at home). Additionally a check can be triggert automatically using an interval. Check one or more network devices using the IPv4 addresses or hostnames. You have to create at least one NetCheckDevice, which will act as a PresenceSensor (present = NetCheck successfull, absent = NetCheck not successfull). To this device you may add some IP addresses/hostnames and/or bluetooth MAC addresses. These are the external devices (e.g. smartphones) which will be checked. Using the needAll option, you can define if all listed devices must be peresent or only one. You may also set a check interval to do a scheduled automatic check. If a ContactSensor is opened, then do a NetCheck and only if the NetCheck failed send a message using telegram. 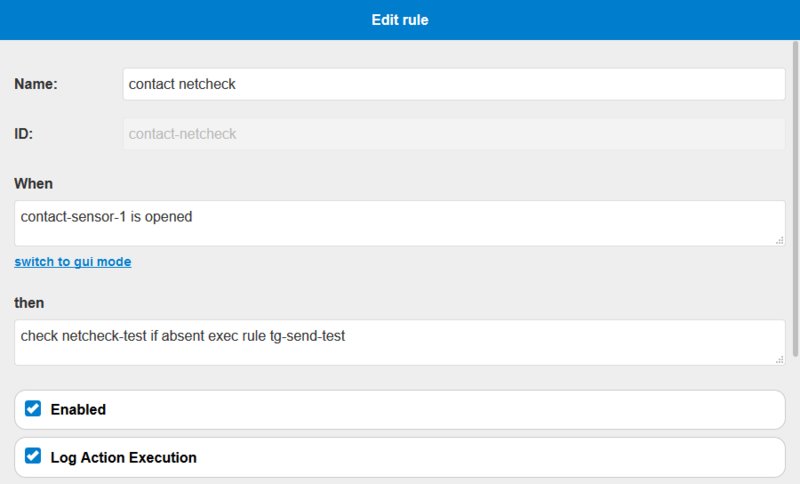 When 1 is 0 then send text telegram to "test"
This will run the NetCheck of the device netcheck-test and if this check reported absent (the check failed) the action of the first rule tg-send-test is executed. 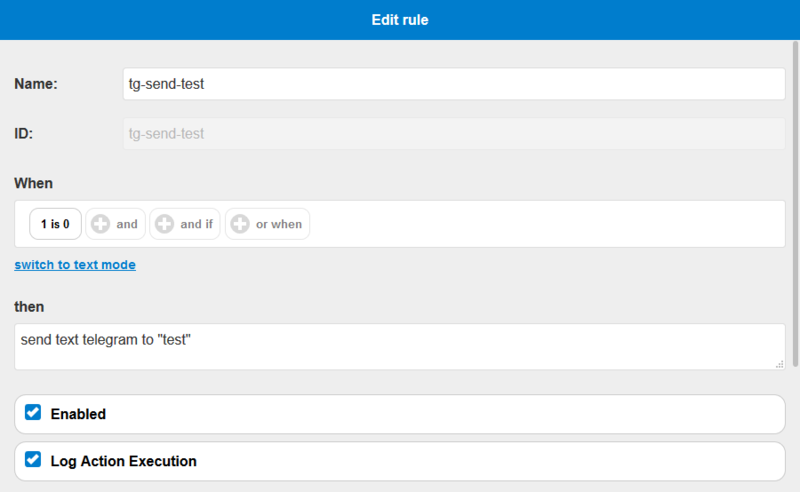 You may also add a rule which gets executed if the check reported present. You need a Raspberry Pi with integrated bluetooth (e.g. 3B) or an additional bluetooth dongle. To use the bluetooth netcheck you must pair your bluetooth device with your Raspberry Pi running pimatic. Set your bluetooth device to "visible". Run hcitool scan from your command line to get the MAC address (e.g. BA:BE:13:37:BE:EF). Pair the devices by running sudo hcitool cc <MAC>; sudo hcitool auth <MAC> from your command line. Make shure to replace <MAC> with your MAC address from step 2. Set your bluetooth device back to "invisible". Check the pairing by running sudo hcitool info <MAC> from your command line. This should print some information about your device. If the pairing was successfull you can add the MAC address to a NetCheckDevice in pimatic.